This entry was posted in Google India Blog and tagged #20YearsOfSearch, AI, Google Search, India, Innovation, ML, Neural Networks on September 25, 2018 by A Googler. The 20th century brought about incredible changes to the way we work and live. There was the combustion engine, the telephone, the assembly line and, of course, the Internet. Today artificial intelligence and machine learning is expected to bring similarly profound changes. And Canada stands poised to lead the world into this new era. Imagine you could take a picture of a mole on your arm and your smartphone could assist your dermatologist in diagnosing if it’s malignant. This is not science fiction, it’s a system Vancouver's MetaOptima is developing today - and it’s powered by artificial intelligence. From diagnosing cancer to reducing data centre energy consumption, artificial intelligence offers a new tool for tackling real-world challenges. Today, at Google Canada’s annual Go North summit, we’re bringing together AI leaders from across Canada and around the world to help Canadian industry better understand the vast potential of this technology to transform their business, shape future innovations and improve our world. Follow along on Twitter @GoogleCanada or tune-in to the Go North livestream (starting at 9am ET) featuring Canadian Prime Minister Justin Trudeau; Google Chairman, Eric Schmidt; founder of DeepMind, Demis Hassabis; OpenAI’s Shivon Zilis; YouTuber Taryn Southern who uses AI to compose music; Geoffrey Hinton and many more including the founder of MetaOptima, Dr. Maryam Sadeghi. Go North will explore Canada’s success in building the superclusters of investment and innovation that have sprung up around the work of Yoshua Bengio in Montreal, Geoffrey Hinton in Toronto and Rich Sutton in Edmonton -- global leaders whose research underpins many of the advances we’re seeing in AI today. The conference will highlight the amazing advancements happening here in Canada and the opportunity for businesses to leverage the country’s rich research pedigree and to unlock the potential of AI. When it comes to artificial intelligence, Canada is having a moment - and we’ll seize it at Go North. This entry was posted in Google Canada Blog and tagged AI, engineering, Go North, GoNorth, Google Canada, Innovation, machine learning on November 2, 2017 by Aaron Canada. It’s time to start sketching, Canada. Doodle 4 Google is back! If you’ve watched our videos, you already know how much we love science... and art! Whenever we visit the Google homepage, we’re always tickled to find a doodle, which combines the best of both. Google doodles are fun illustrations of the Google logo that celebrate holidays, anniversaries, and the lives of famous artists, pioneers, and scientists -- everything from the discovery of water on Mars to Canadian inventor Sandford Fleming’s 190th birthday. As Canada blows out a whole lot of candles this year for its 150th birthday, what better way to celebrate than by imagining what the next 150 years will look like? 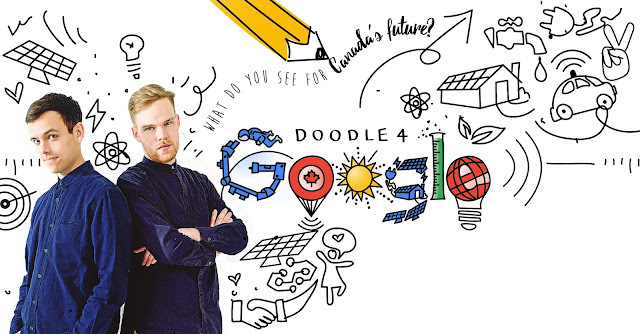 That’s why Google is asking students to submit doodles based on the theme: “What I see for Canada’s future is…”. Creating the top doodle comes with major perks: not only will their artwork adorn the Google.ca homepage for a day, but the winner will receive a $10,000 university scholarship, a $10,000 technology grant for his/her school, and a paid trip to the final Doodle 4 Google event in June. For more details, check out g.co/d4gcanada. To help judge this year’s competition, the Honourable Kirsty Duncan, Minister of Science, En Masse co-founder Jason Botkin, president of the National Inuit Youth Council Maatalii Okalik, and Google Doodler Sophie Diao, will join us as your panel of esteemed doodle judges. When we come up with themes for our videos, we look to cool things in science and tech for inspiration. If you know a young artist that may need a little nudge to get their creative juices flowing, we’ve worked with Google to create classroom activities that will help parents, teachers and students brainstorm, design and submit their doodles. Participating is easier than ever. This year, students can submit a doodle made from almost any medium….including code! Ladies Learning Code created an online tutorial offering inspiration and a step-by-step guide to coding a Google doodle. Check it out here. In Toronto in April? All throughout the month of April, parents and kids can visit the Art Gallery of Ontario to get inspired and create a doodle during Family Sundays. Teachers and parents can download entry forms on the Doodle 4 Google site. Doodles can be uploaded digitally to Google’s site or mailed directly. Submissions are due on May 2nd. There’s no limit to the number of doodles from any one school or family... Just remember, only one doodle per student. Let’s get our doodle on, Canada! This entry was posted in Google Canada Blog and tagged Art, Canada, Canada 150th, Contest, Doodle, Doodle 4 Google Canada, Google Canada, Google Doodle, happy birthday Canada, Innovation, technology on March 15, 2017 by Aaron Canada. Editor's note: If you’re in the Austin area today for SXSWedu, come visit the Google Fiber Space (201 Colorado Street) to attend a range of sessions on innovation in the classroom throughout the day. See the full schedule of sessions at the Google Fiber Space. Can't make it? Don't fret, all presentations will be added to the schedule after the event. What’s the secret to inspiring the next generation of innovators? Today SXSWedu in Austin, Texas, we’ll hear thoughts about this topic from a host of speakers, including Monica Martinez, regional director at EdTechTeam, and a panel of Google Science Fair student winners. While inspiration comes in many forms, it’s clear that technology, along with support from teachers, parents and advisors, is key to motivating students to make a difference in their communities and beyond. Here’s an overview of what these inspiring speakers will be sharing. “Everything I’ve done in my career involves using technology to become more efficient,” says Monica Martinez. “I want to inspire educators and teachers to do the same, to solve problems and create workflows that would otherwise be cumbersome.” As regional director at EdTechTeam, her goal is to help educators embrace tools, such as Google Apps for Education, to better manage their work. Martinez has been passionate about technology since childhood, when she started using her uncle’s computer for school projects and to teach herself how design. She built a career in design and educational technology — the two topics that have inspired her SXSWedu session about creating the ultimate workflow for educators with Google Apps. “Teachers often are concerned that they don’t have enough time in the day to get everything done,” Martinez says. This problem is compounded when teachers feel ill-equipped to use new technology. Martinez leads workshops to show teachers how easy-to-use technology can help with their daily tasks. Beyond the efficiency benefits, technology helps to create a culture of empowerment. When educators model new technology, they can inspire students to do more with the tools at their disposal. “Telling students to think critically, experiment with new things and collaborate is fine, but if they don’t see their teachers, mentors and advisors doing the same, the message isn’t as strong and sometimes lost,” says Martinez. 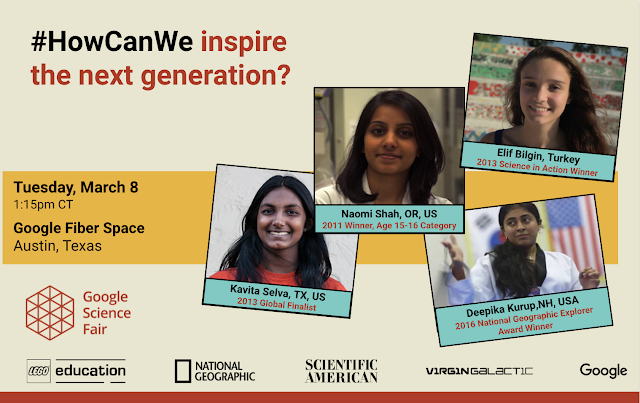 Kavita, Elif, Naomi and Deepika are young inventors who will be speaking about how to motivate future innovators, explorers and pioneers. Aside from being Google Science Fair finalists and winners, these four young people have something else in common: supportive and dedicated mentors. “Many teenagers are sitting at home all over the world with big ideas and questions, but they don’t know how to get started making a difference. Teachers, parents and mentors in their communities can play a powerful role by supporting these students,” explains Andrea Cohan, program lead for the Google Science Fair. Students that participate in the Google Science Fair are able to explore and interact with science, engineering and their communities — global and local — in a way that enriches the typical classroom experience. From finding sustainable alternatives for manufacturing and water purification to improving air quality, the students on this panel have no shortage of world-changing ideas. For example, Elif, who is from Istanbul, Turkey, found a way to use banana peels to produce bio-plastic as a replacement for traditional petroleum-based plastic in her project, Going Bananas. SXSWedu attendees are in a position to positively impact students’ lives. “You can help them find the resources they need to get started, discuss their ideas with them and simply be a supportive sounding board. Every student on this panel attributes part of their success to the mentors, like you, in their lives,” Cohan says. To hear from these speakers and more, join us for these sessions at the Google Fiber Space. If you can’t make it in person, follow #GoogleEdu to stay up to date and check the event page where we'll post the presentations. We also encourage all students ages 13-18 (from anywhere in the world!) to participate in the 2016 Google Science Fair, which is open for submissions until May 17. This entry was posted in Google for Education Blog and tagged Education, Google Science Fair, Innovation, SXSWedu on March 8, 2016 by Miriam. Editor's note: If you’re in the Austin area for SXSWedu, come visit the Google Fiber Space (201 Colorado Street) to attend a range of sessions on innovation in the classroom today, Monday, March 7 and tomorrow, Tuesday, March 8. See the full schedule of sessions at the Google Fiber Space. The audience today at SXSWedu has a lofty task in front of them: inspiring and motivating the future generations to innovate, create and make a positive impact on the world. Today, we’re introducing three of the many educational technologists who are hosting sessions at the Google Fiber Space on how technology can help students excel in the classroom and in their future careers. Jason Carroll, Global Products Manager at Texthelp, will discuss how literacy, accessibility and dyslexia tools help students learn to love reading. Erin Mindell Cannon, Research Education Program Manager at Google, and Abby Bouchon, K12 Education Outreach Specialist at Google, will share tools and resources computer science educators can use to inspire a passion for technology in the classroom. Here’s a brief snapshot of what these speakers will be sharing. If you won’t be at SXSWedu, all presentations will be linked to the schedule after the event. While children are naturally curious about the world, they often lose this love of learning when they feel frustrated. “The biggest barriers to students achieving academic success is lack of effective strategies to help students when they are struggling,” Carroll says. It can be tricky for teachers to create individual lesson plans when they have classrooms of 30 or more students, all with different learning styles. Tools like Texthelp make it easier for educators to provide personalized learning plans and help students gain confidence. Reading proficiency is an important building block for academic success, but mastering the skill can be frustrating for students of all levels. Technology can help students improve their reading proficiency fast and practice reading aloud at their own pace. With Texthelp’s Fluency Tutor, for example, students can record themselves reading, practice until they feel confident about their effort and share the recording with their teacher. “My daughter loves using it. She’ll record herself reading a passage then listen to it. If she’s not satisfied with it, she’ll re-record it until she’s happy,” Carroll says. Tools like these keep students engaged and allow teachers to measure progress over time, but ”it’s more than just handing over the device,” Carroll says. When you combine hands-on instruction with technology, each student gets personalized attention and encouragement. Erin Mindell Cannon and Abby Bouchon, who work with Google to inspire students of all backgrounds to learn computer science, believe educators play a critical role in boosting confidence. Google has published three studies on K-12 CS education and found that a key factor for guiding women to major in computer science (CS) in college is encouragement from parents, educators and peers. On the flip side, students can be discouraged from exploring CS because of the lack of diverse role models. “In another research study, we found that parents and students associate computer scientists with the stereotype of white males who wear glasses,” Bouchon says. Educators can promote a diverse range of role models and make sure the school subject is accessible and engaging for students and teachers from different backgrounds. Students can be inspired if they feel that the work they are doing benefits society. “If a student believes she’s capable of creating a new technology that can make a positive impact on the world, that’s a motivator,” Cannon says. Students who understand the practical applications of the technology skills and the positive impact they can have in their community -- such as designing a mobile app that geotags local graffiti and organizes a volunteer event to clean it up -- are more likely to excel in the classroom. Interested in learning more about how technology motivates students to succeed? Stop by the Google Fiber Space at 201 Colorado Street to check out these sessions and more today, March 7th. This entry was posted in Google for Education Blog and tagged Education, Innovation, SXSWedu on March 7, 2016 by Miriam. Editor's note: If you’ll be in the Austin area for SXSWedu, come visit the Google Fiber Space (201 Colorado Street) to attend a range of sessions on innovation in the classroom on Monday, March 7 and Tuesday, March 8. See the full schedule of sessions at the Google Fiber Space and stay tuned for more posts over the next few days about other session topics and presenters. If SXSW is about emerging talent in the film and music space, SXSWedu is the convergence of educational creativity and social change. At this year’s South by Southwest EDU (SXSWedu) conference, we’ll be there highlighting some unique ways schools are truly changing what it means to get an education by giving students the tools to think creatively and carve their own learning path. We talked with three educators and technologists who will be giving sessions in the Google Fiber Space next week: Bill MacKenzie on how his students are creating a 360-degree virtual reality experience; Emily Henderson on expanding the classroom walls to take field trips across the world; and Vincent Giersch on creating music in a collaborative way. When students used virtual reality in the classroom for the first time, they leapt out of their seats and were transported to a different world. But Upper Grand District School Board took the experience one step further by having students create their own virtual reality experiences. Using a Theta 360-degree camera, students in grades 6 through 8 create videos that encourage them to think creatively and develop a new perspective on the video development process, such as storyboarding with 3D imagery. The videos allow students to give parents and others an inside view of what it’s like to go to school at Upper Grand District. Students have created documentary-type videos showing students playing dodgeball in PE class, interacting with teachers in class and walking down the halls during break. They also have created videos that benefit the community as a whole. For example, Bill MacKenzie, IT and Program Liaison at Upper Grand District School Board, responsible for developing IT strategy and training teachers how to use technology in the classroom, wanted to convince the board of trustees to invest more in parking lot safety. Students created a 5-minute video using time lapse photography to show an hour of cars coming and going during morning drop-off and afternoon pick-up, and in essence, transported the trustees to that moment in time. As students use technology to give them a global perspective, it’s clear how important it is to increase students’ universal awareness and love for the environment. Maps and pictures from around the world encourage students to think about places from a different perspective, sparking curiosity and engagement. With Google Expeditions, students are able to take immersive virtual reality field trips to the farthest corners of our planet. For example, students in the Samburu Expedition traveled to north-central Kenya to learn about the unique qualities of elephant families and how harmful poaching is to the elephants and ecosystem. “After the field trip, Google mapping tools enable students to go nearly everywhere, learn about anywhere, create rich experiences and share their stories right from their Chromebooks,” says Emily Henderson, Google Geo Education Program Manager. 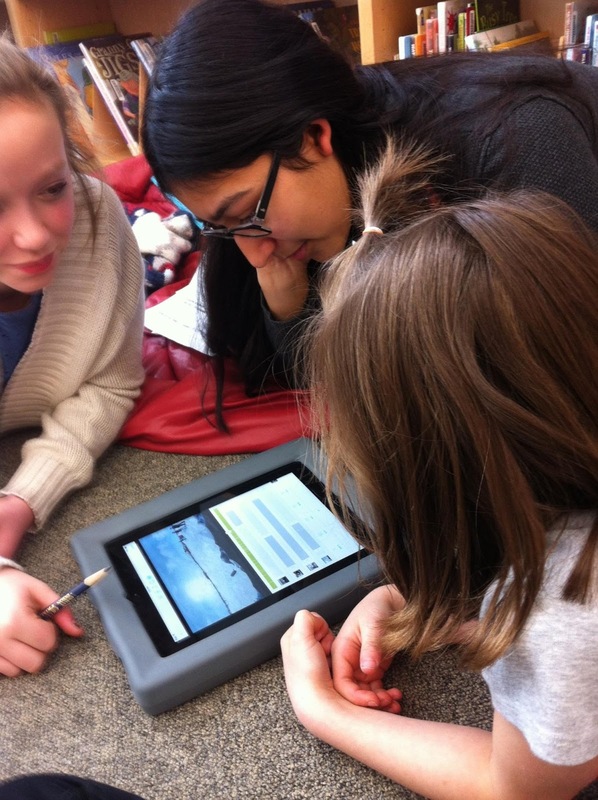 As the classroom becomes more collaborative, music students are turning individual projects into group projects using software called Flat for Education. When students compose together, they share their knowledge by combining their music creation ideas and learn from each other’s work. For example, a small group of students can write the parts for their own instrument using the collaborative music notation editor Flat and then perform the end result of individual efforts together. Interested in learning more about these topics? Join us at SXSWedu to hear MacKenzie share tips for introducing virtual reality in classes, Henderson talk about the cool places students are traveling with Google Maps, and Giersch discuss how technology can help music students collaborate creatively. If you’ll be in the Austin area this week, come visit us at the Google Fiber Space to attend a range of sessions on innovation in the classroom. See the full schedule of sessions and stay tuned for more posts throughout the week. This entry was posted in Google for Education Blog and tagged Education, Innovation, SXSWedu on March 4, 2016 by Miriam. This entry was posted in Google Europe Blog and tagged Europe, Innovation, Journalism on February 23, 2015 by European Public Policy Blog.